Join us on this seven-day intensive course where we will captivate you in the art of the Byzantium painting technique. 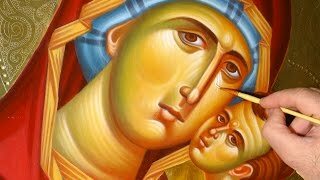 This is a complete course suitable for both beginners and advanced students, during which you will learn all the techniques and methods of Byzantine iconography. You will acquire the necessary technical training and knowledge required to paint a Byzantine icon. During the course we'll write (paint) the icon of Mother of God. This “Mother of God” icon will come alive before you as I will, guide you, step by step, through the ancient techniques of Byzantine Iconography. Let us journey together, discovering anew, this traditional artistic expression of theology and spirituality, often called the "meeting place of the Divine". Whether you are a beginner or an advanced artist, this workshop offers an opportunity to learn or refine your techniques in this sacred art. My goal for you is, through this workshop to experience the spiritual world of iconography, help you comprehend the principles, the philosophy as well as the techniques of this art, and broadened your knowledge in iconography. The course focuses on the art of egg tempera painting. The coursework is divided into individual steps; I explain the techniques and then demonstrates each phase in detail, answering all questions.Through the process of demonstrations the stages as well the whole method of painting an icon will be presented. The students will then put into practice these skills under my guidance. The techniques of painting will be taught in a clear and concrete way enabling the students to easily apply these techniques. From the very beginning to the completion of the course, every student will work on his or her icon. The schedule of courses runs daily from 9 am until 16:30. Sunday September 15th, is a day off for the students. Course fee: €580. The price includes all materials including boards, pigments, brushes, etc. A non-refundable deposit of €200 is required to reserve a place in this workshop. The remaining balance is due upon arrival on September 11, 2019. If you are interested in signing up, please make the deposit of €200 using the button below. You can stay at hotel Helena if you wish, which offers a special discount to my students. Single room: €30 per night including breakfast. Double room: €40 per night including breakfast. Hotel Helena is located in the center of Larissa, just three minutes walking from my studio. If you wish to stay at hotel Helena, do not book your room online because you will not get the discount. Contact me and I will book your room. It is very easy to get to Larissa from Athens. There are five trains a day from Athens, and the duration of the trip is 4 hours. You can also come to Larissa from Thessaloniki, as long as you can find flights to Thessaloniki airport. There are trains almost every two hours from Thessaloniki to Larissa and the duration of the trip is just 1:30 hours. Click here to learn more about the train route & timetables from Athens as well as from Thessaloniki. We recommend you to visit the beautiful and unique natural monument of Meteora, where you can see a complex of monasteries builded on vertical high rocks, called 'columns of the sky'. This amazing a marvel of nature makes Meteora one of the most spectacular places to visit in Greece. Meteora is just 1.30 hours away from Larissa by car. The cost of the excursion is approximately €50. This will be a full day excursion with a tour guide and a minibus exclusively booked for the students. This excursion is optional and is not included in the course fee. This is a separate optional two-day gilding workshop. Water gilding is a traditional and highly skilled technique used for the gilding of icons. During this workshop students will learn all the stages of water gilding technique using 23 carat gold leaf. Beginning with the preparation of the board which is done by applying linen then covering with many layers of gesso. The last stage of the process is applying the clay bole and finally burnishing the gold with an agate stone which results in gold that is smooth and shines like a mirror, obtaining a brilliant and very impressive effect. Those students who participate in the water gilding workshop will practice the water gilding on the halo of the Mother of God icon, which is the icon that will be completed in the icon painting workshop immediately following the water gilding workshop. Each student will practice the water gilding with any needed assistance given by the instructor, Theodoros Papadopoulos. Course space for the water gilding workshop is limited. Please register early to guarantee your spot. The schedule of courses runs from 9 am until 18:00. Course fee: €250. The price includes all materials that will be used by the students. Students participating in both icon painting (September 11-18) and water gilding workshop will pay only €200 for the gilding workshop. A non-refundable deposit of €80 is required to reserve a place in this workshop. The remaining balance is due upon arrival on September 9, 2019. If you are interested in signing up, please make the deposit of €80 using the button below. If you wish to stay at hotel Helena, do not book your room online because you will not get the discount. Contact me and I will book your room.